Characterized by a yellowish raised part of the scleral conjunctiva (the lining of the white part of the eye), a pinguecula usually develops near the cornea (colored part of the eye), but does not extend past it. Similar to a callus on the skin, changes in tissues lead to the buildup of calcium, fat, and/or protein, causing the bump or patch known as a pinguecula. A pinguecula causes a feeling of irritation – you may feel like something is caught in your eye. In some cases, a pinguecula leads to pingueculitis, a condition in which the pinguecula becomes swollen, irritated, and red. Often exposure to extreme dryness, wind, sun, or dust leads to pingueculitis. Wearing a hat and sunglasses while outdoors will help prevent pingueculitis. The exact cause of pinguecula is not fully understood, but the condition has been associated with unprotected exposure to the sun's ultra violet rays. An eye care professional can diagnose pinguecula with an examination, using a slit lamp to view the eye closely. Treatment depends on the severity of the symptoms present. Lubricating eye drops might be prescribed to relieve mild irritation, and if inflamed, either steroid eye drops or oral non-steroidal anti-inflammatory drugs. In severe cases, where the pinguecula interferes with blinking, vision, or contact lens wearing, surgical removal might be necessary. Pingueculae often lead to the formation of pterygia, wedge-shaped growths elevated from the scleral conjunctiva which grow past the cornea. Like pingueculae, pterygia are non-cancerous growths, but pterygia contain blood vessels and have the ability to permanently disfigure the eye, transforming its shape with scar tissue. 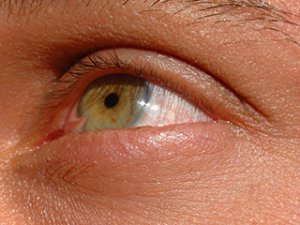 A pterygium is spurred on by exposure to the sun and wind. For this reason, the condition is often referred to as surfer's eye. Pterygia often cause a foreign body sensation and can become red and swollen. When a pterygium grows large enough, it can distort the shape of the eye, causing astigmatism and visual acuity problems. An eye care professional will make a diagnosis based on a close observation with a slit lamp. Pterygium treatment depends on the severity of symptoms, whether the pterygium is growing, and its causes. Mild cases can be treated with steroid eye drops. Severe cases require surgical removal, usually performed in the doctor's office with local anesthetics. To prevent regrowth, an eye care provider might perform an autologous conjunctival autografting.